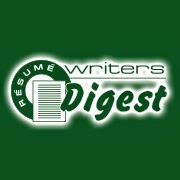 One of the biggest issues for new resume writers is the "feast or famine" nature of the work. As you're working to get your own clients, you may consider working as a subcontract writer for another resume writer or a resume writing service (often referred to as the "contracting writer" or "contracting firm." Are you self-motivated? You need to be the type of person who can get work done when it needs to be done. If you've been assigned a project and a deadline, it's up to you to decide when, where, and how to get it done. How are you at managing your time? You'll need to estimate accurately how long any one resume will take you to write you -- and be able to do this with multiple clients. How will you handle things if you get your OWN resume client while you have three subcontract projects to write? Deadline management is critical as a subcontractor. Can you work with different personalities? Whether you're a subcontract resume writer or not, you're not working with just one individual at a time. However, it's important that you get along well with your contracting writer (or your contact at the contracting firm). Do you have your own tools? I'm not talking about hammers and nails. You'll need a computer, Internet connection, and software (Microsoft Word). As a subcontract writer, you're responsible for supplying your own tools. Are you good with money? If you're not good at budgeting, being a subcontract writer might be difficult. For example, you may write 8 resumes this month for one contracting writer and receive a $1200 check. Should you spend all $1200 this month because you earned it this month? No. You should save some for taxes, savings, and for the slower months. There's still feast or famine moments. Payment doesn't always come on time, like it does with a job. Even your contract writer may have slow times, so that makes it harder to budetyour money. If you can budget through the hard times and ride the wave, you'll make it as a subcontract resume writer. Hopefully, this has given you some things to think about when it comes to becoming a subcontract writer. There's lots of other things to consider too, of course, like how to find a contracting writer or contract firm to work with. I've got a resource that will help you with that too. 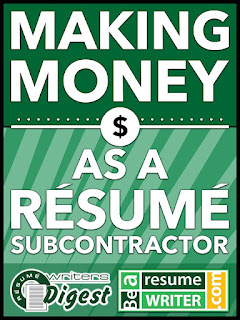 Check out the"Making Money as a Resume Subcontractor" special report and directory of contracting writers. 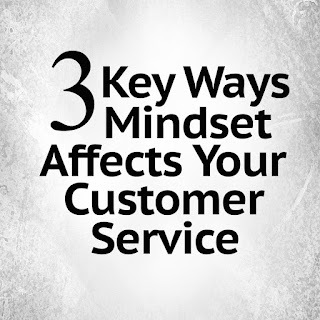 The term was coined by author David Meerman Scott. Today, Adam Zajac of Vocamotive Inc., published a great example of how to newsjack the presidential election coverage -- tying his resume writing services into a current event. He published "What To Do When Your Resume Needs a Little Work" on Buzzfeed. 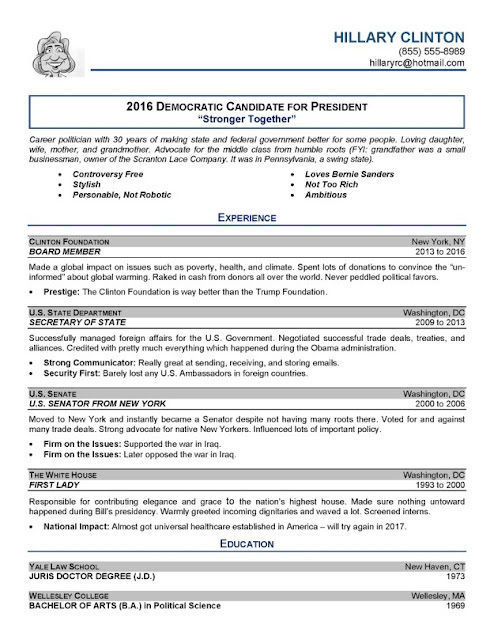 It features fictionalized resumes for presidential candidates Donald Trump and Hillary Clinton. © Copyright 2016, Adam Zajac, Vocamotive, Inc. He presented both samples as "WHAT NOT TO DO" -- which I think is smart, although I would have gone a step beyond the content and provided some editorial guidance that relates to WHY those are "don'ts" on the resumes -- for example, the dates on the education section, the lack of strong accomplishments, and the presence of the candidate's photos on the resumes. He doesn't pick a side. He's equally hard on both candidates in the content of the resumes. This wouldn't work if he did it only to satirize Donald Trump, or if he only did Hillary Clinton's resume. In that case, you're only appealing to half your audience, AND you run the risk of alienating potential customers. He picked the right time. 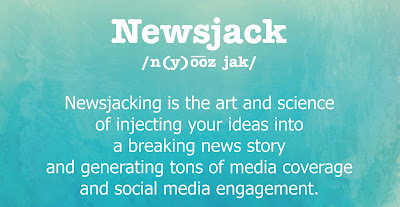 The right time to newsjack is when the topic is at the top of everyone's mind. You don't float a story about lying on resumes unless there's a story in the news already about someone who lied on their resume. In the same vein, this close to the election is the perfect time to satirize the candidates' qualification. It's funny. 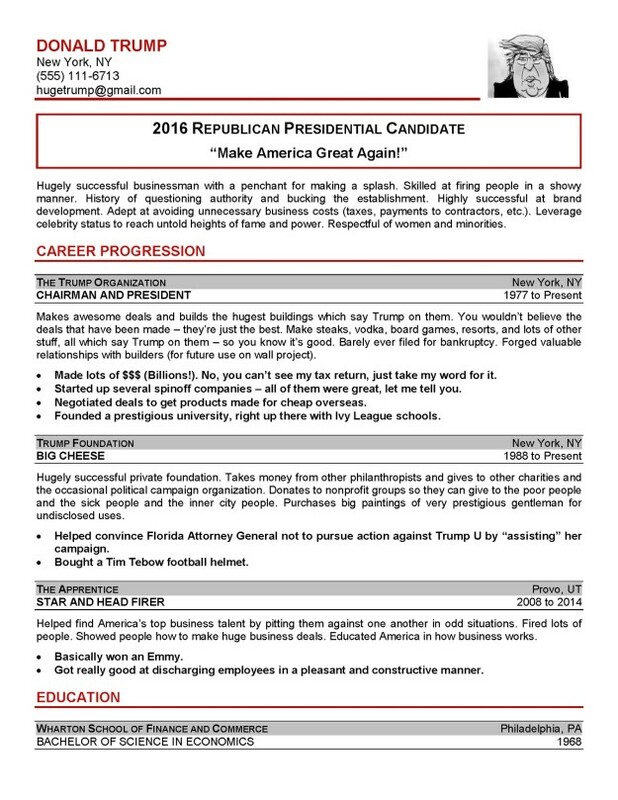 If you read the resumes, they're pretty spot-on in terms of their parody. He did his research and has the facts right (educational credentials) while making fun of some of their more controversial "qualifications." The version of the article that is currently up on Buzzfeed is Adam's second attempt. Buzzfeed has a "user-submitted" section, and he originally published a version that included a flier that gave soon-to-be unemployed politicians a discount on their resume services. I thought this was brilliant (and could be the subject of its own article after the election), but you have to remember that the first part of "newsjacking" is news. It's self-promotional without being overly self-focused. You can still promote yourself as a resume writer (and draw attention to yourself/your resume writing business) but without directly selling your services. He had to remove the flier promoting his services in order for the article to be re-published. Take note: This same concept could be used to create a parody resume for fictional characters, like Santa Claus or the Easter Bunny. Or, remember, you can newsjack almost any employment-related topic. For more information about David Meerman Scott, check out the fifth edition of his book, "The New Rules of Marketing and PR: How to Use Social Media, Online Video, Mobile Applications, Blogs, News Releases, and Viral Marketing to Reach Buyers Directly." 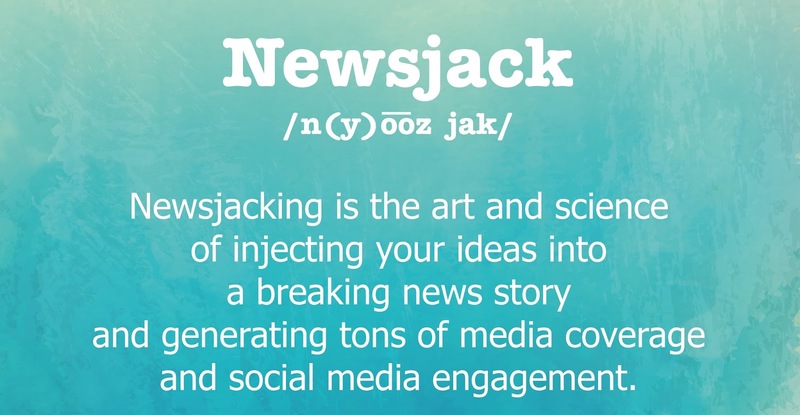 David Meerman Scott also teaches a course on Newsjacking. This kind of article makes me MAD. And it got over 78,000 views. "Move Over Resume, You've Been Replaced." What makes me SAD is that it's written by a well-respected individual in the careers industry. He's not a resume writer, though -- and, consequently, he has his own agenda. And that's the problem with a lot of information that jobseekers are reading. It's written by people with an agenda. THAT in itself isn't an issue (EVERYONE has an agenda) ... but the problem is, the people being quoted most often about the job search are NOT resume writers. They're recruiters, they're professors, they work for the big career sites (CareerBuilder, for example), or they're selling something. And that's fine. But OUR VOICE -- as resume writers -- is not being heard. There are only a handful of people in the careers industry who are speaking up for all of us, as resume writers. They're being quoted in the media about the resume as a tool to land interviews, as a guide for interviewers to uncover the value of the candidate, as a way for jobseekers to discover their worth prior to starting the job search process. But we're being drowned out by louder voices -- many of them sharing misinformation (about one-page resume limits, the death of the resume, and wacky job search tactics) that are not only WRONG, but they're anecdotes of a job search without a resume. ("I don't need a resume -- I can put a QR code on a cupcake.") The truth is, the vast majority of successful job searches start with a well-written resume. But that story isn't being told. Our colleague Michelle Aikman brought up this problem a few months ago on the NRWA E-List. Our industry has a "perception problem." We put our heads down and do our work and think that writing great resumes will bring us clients. It does. But we CONSTANTLY have to fight battles with clients about resume length, putting pronouns in the resume, and even PRICING because the information they're getting in the media isn't what WE want them to know. And we're dismissed by university career center personnel, recruiters, and others who we should be able to work with collaboratively, because they don't know what we do, and how we help jobseekers (and can help THEM in the process!). The webinar series will teach you how to help tell YOUR story -- and our industry story -- in very practical ways. Even if you don't want to be one of the 10 most-quoted resume writers in the industry, we need you to speak up when you get the chance. Even if it's on a very small scale. It doesn't mean you have to appear on the local morning news (although I'll teach you how to do that, if you want to!). It's about being intentional about shaping the perception of our industry. About sharing information about how the work we're doing is putting people back to work. What IS public relations? It's defined as "the professional maintenance of a favorable public image by a company or other organization or a famous person." No one is going to do this for us. We're not physicians, with the American Medical Association helping shape public perception. The vast majority of the professional associations in our industry are either volunteer-led or mostly run by volunteers. If we want to STOP the spread of misinformation, it has to START with us. If you're tired of reading articles about "the resume is dead," and "you shouldn't pay someone to write your resume for you," check out my "Social Media Strategies" call. One of the biggest mistakes new resume writers make is that they do a GREAT job with sharing content, information and resources when they start their business -- but as they get busier, that's the part of their to-do list that gets moved down to the bottom. Content helps establish you as a thought leader and resource -- a "servant leader" in the careers space. If you don't establish yourself as an authority figure, no one is going to pay attention to you and you'll just be another resume writer that does what everyone else is doing. Originality is key to rising above others in the career services industry. 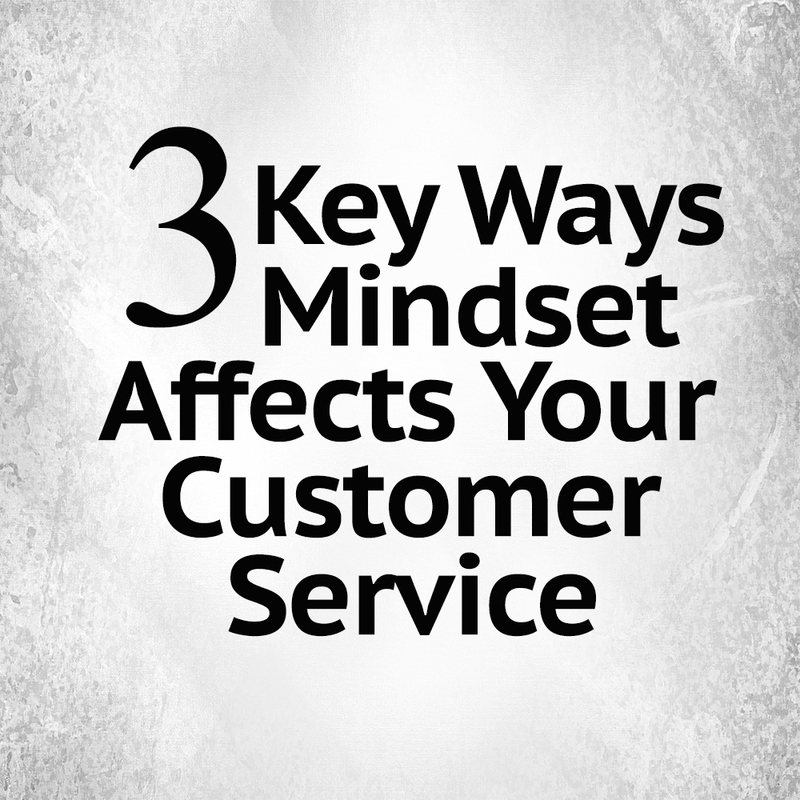 You have to keep some things in mind when figuring out how to serve your audience best. First, brand yourself in memorable ways. That means creating a name that will pop in your audience's head and stay there, including the headshot or logo that you use on all of your sites and products. When visitors see that image, they will automatically know it's you. You have to be willing to put yourself out there -- no matter how critical you are of yourself -- your age, your teeth, your size -- no one cares. What they want is information. Be original. Come up with unique angles to market your resume writing services. It doesn't have to be difficult. It can be something as simple as sharing your day-to-day life with others so they can better relate to you. And it doesn't have to be extraordinary. 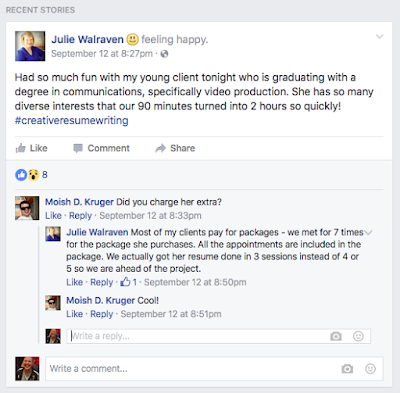 I've mentioned this before, but one of the best things you can do as a resume writer is talk about the work you do with clients on Facebook -- WITHOUT using client names (or too much identifying information). Be knowledgeable. Becoming an authority in the career services space is actually the best way to serve your audience. Make it a point to learn more than the average resume writer in your niche knows and solve problems and find solutions for your audience. Get deep into your topic. Give yourself a thorough education in it. Read, take courses, pursue certification -- become the leader they need you to be. Put yourself out there. Social media, blogs, forums and related sites are all good ways to make yourself known. And, make sure you don't just make an arbitrary comment like "me too." Give advice, value, opinions and insights when you speak and people will listen and remember you. Don't be scared to stand out from the crowd. To blend in is what will make you mediocre. Publish on Amazon. If you can put together an eBook for Kindle, it will boost your authority tenfold. Avoid spamming at all cost, but make sure you release content or products on a regular basis. It takes time, planning and lots of research and forethought -- but if you really want to be the best, it will make a ton of difference because the smalltime players get paralyzed and lack consistency. As you may know, I run a membership site for professional resume writers that provides them with done-for-you content they can use with jobseekers. I offer an "EVERYTHING" membership for new members (or those who may not have been a member since the very beginning). 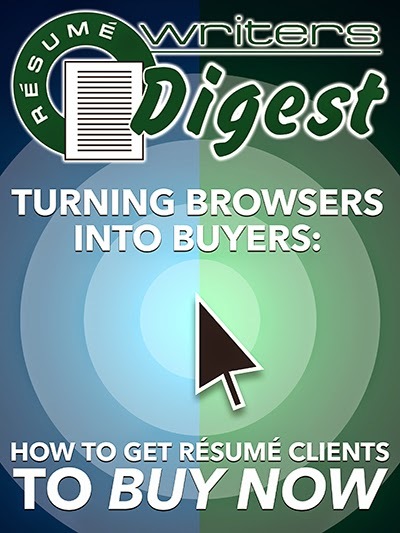 It unlocks the Pass-Along Materials "vault" with more than 50 content packages -- everything your jobseeking clients need to know to help them in their job search. One amazing thing about the EVERYTHING access is that you also get the Pass-Along Materials that aren't available for sale. And, you get access to all the Special Reports too, dating back to 2012. It's more than $1,000 in content that will help YOU and YOUR CLIENTS. If you're interested in getting EVERYTHING, or have questions, email me! 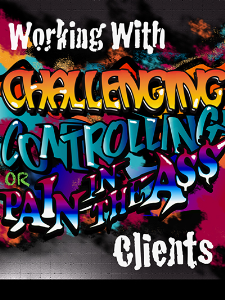 I'm getting ready to launch the next session of the Get Clients Now program. If you are struggling to succeed and missing the mark, the answer may lay in your strategic planning. You may not be looking at the big picture enough to understand the small things that go into succeeding on a project. Maybe you don't really understand proper planning and organizing yet. Have you really thought about what success looks like? Take the time right now to write down exactly what success looks like to you. Does it mean more money, more freedom, or something else entirely? There are no wrong answers, but if you don't have an answer and you don't know what constitutes success, it will be hard to feel as if you're successful. If you think about it, this is true for any project you are working on. What should the deliverable look like? Answer that and you have your starting point. What Are the Steps Needed to Get to Success? Can you pinpoint exactly the steps needed to reach success? Do you know how long it will take, how many hours each day you will need to focus on the steps needed to reach success? It's important that you can look at what the end result is supposed to be and work your way backward to the beginning to design the steps necessary to reach success. The big vision at the end starts with what you're going to do Monday morning at 9:00 a.m.
Once you've defined what success is, and designed the steps that will get you to success, now it's time to act on these steps and do them. No one gets to success without taking action. Action is the forward movement that will help you wind up at your destination. If you're spinning your wheels, you may be stuck in one of the planning phases. Move out of that planning phase and start acting. Are the Steps You're Taking Creating Momentum? It's also important to build in a few stops along the way toward your goals to evaluate how everything is going. Is what you're doing leading you to success? Are you getting some results that indicate that you're on the right track? If so, keep going. If not, re-evaluate if your plan is sufficient to move you toward the success that you need. Is something missing that is crucial to getting to success, such as a skill that you need to take time out to learn? If so, you may need to add in time for learning, but don't trick yourself into thinking learning is action. It's not. Defining success, planning based on the definition, then acting on the plan and putting into motion the steps necessary to achieve success, are all important components of moving behind the struggle to achieve success and finally experiencing success. One thing that will ensure the failure of your business is wasted time. Don't confuse "wasted" time with the time it takes to renew your physical or mental power. That's important, too. Exercise is good for both -- and you need it to keep yourself primed and ready for what's ahead. You know what you're doing to waste time -- it could be watching reruns on television for hours at a time, playing games with your friends online or on your smart phone -- or, as Jon says, wasting time on Facebook. If you think your wasted minutes and hours are getting out of hand and causing a downturn in your business efforts (and it's time to be tough on yourself and honest about this), then it's time to rethink how you manage your time. Good time management skills can set you on the right track for success. Without them, you can falter and all of your dreams for the future can wither and die. Here are some good time management tips to add to your daily routine, if you're ready to turn up the heat on your progress. Put some pressure on yourself to get it in gear! Decide how much time you're going to spend on thoughts, conversations, and actions. You may want to monitor yourself for awhile by recording how much time you spend on the three categories of your day during working hours. At the end of the week, you should know where (in which category) you're wasting the most amount of time. Don't fudge the numbers just so you can get away with more. You have to be tough on yourself to make progress. Block distractions. Tricks like blocking email and Facebook alerts, turning off your phone and hanging a "do not disturbî"sign on your home office door can work wonders. Many resume writers use programs such as Facebook for business reasons, but when you're on the site, don't let yourself be distracted by anything other than business. Set a time to begin work -- and stick to it. After you turn on your computer for work, give yourself a certain amount of time (5 minutes or so) to surf the 'net and review your email. Then, switch to work and don't look back until you're finished. Going back and forth between email, Facebook and work muddles your mind and makes it more difficult to focus. If you have to work longer than the stop time, take frequent breaks, get up and walk around and do something to get your mind off work. You can't be chained to your business 24/7 -- even if you think you want to be -- it's just not beneficial for your success. Distinguish busy work from working toward goals. Busy work can be a waste of time. You may be procrastinating because you're not ready to meet the goal or you're scared of failure if you do complete it. The best way to beat procrastination is to take action. Don't coddle yourself by wasting precious time. Set some hard-and-fast rules of time management and stick to it. Think of yourself as an employee. Would you tolerate your paid worker surfing the Internet or playing a game app on his or her phone? Of course not -- so don't allow yourself to do it, either! There were a LOT of takeaways from the 2016 NRWA conference in Annapolis. You can read some of my tweets at the #theNRWAConf2016 hashtag, but I did a Facebook Live broadcast today with my top nine takeaways. You can watch them here. Takeaway #1: Jean Austin: Presenting Your Clients' Talents, or Answering the Big "So What" Question? Did they complete a project ahead of schedule? Did they satisfy an unhappy customer? Do they go above and beyond the scope of their job? What would others who worked with them say they contributed? Thomas got us thinking about the reder of the cover letter. What do they want to know about the jobseeker? Takeaway #3: Colleen McKenna: "LinkedIn: It's Not Social, It's Business"
5.4 people are now involved in most corporate decisions -- including hiring. That means more than one person is looking at your LinkedIn profile. The number one activity on LinkedIn is looking at people's profiles -- everyone's sounds the same. The ones that stand out talk about the "why." 60% of people look at LinkedIn profiles from a mobile device -- keep it short and sweet. If you're using LinkedIn Publishing, experiment with Sunday morning posts. One thing McKenna said is that she thinks browsing social media has replaced the old habit of reading the newspaper on Sunday mornings. If you want to increase your chances of getting your LinkedIn Publishing posts picked up on LinkedIn Pulse, have great content. Publish frequently. Use hashtags. Include 5-6 images on video. And produce long content -- 750 to 1000 words. I think my favorite session at the conference was Kimberly's. She took the initiative to conduct a survey of 273 recruiters and hiring managers (plus 10 one-on-one interviews) using the RiseSmart database. 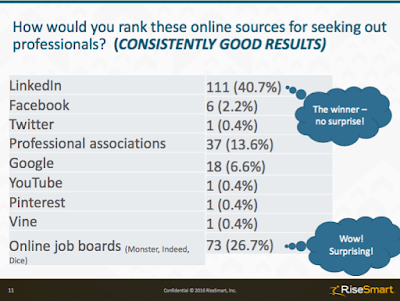 40.7% cited LinkedIn as an online source of candidates. "Oneline job boards might results in an interview, but they are LESS likely to result in a job offer." Very interesting. 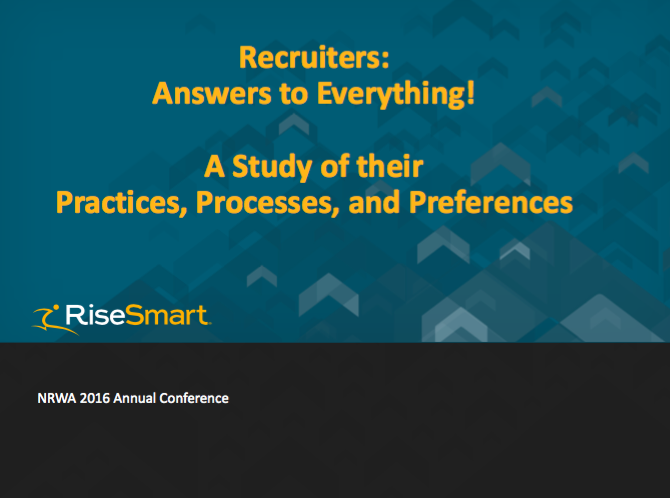 67% of recruiters actually use their Applicant Tracking Systems (ATS). So it's particularly important for resume writers to make a strong tie between the client's job requirements and the position. Some recruiters said an unnecessarily long resume will date you. 84% of companies use in-person or phone interviews. Only 4% use recorded video Q&As. One of the neatest things about conferences is the opportunity to interact with other participants before and after sessions, and learn from them in the sessions. Conference chair Dawn Rasmussen added four concurrent "Town Hall" sessions this year to allow this kind of interaction among participants. I attended the one on pricing. Several resume writers said they have trouble quoting high prices over the phone -- so they tell clients they will email them a proposal. Remember that not everyone who calls you is a customer. Ask questions before you quote a price. (This will help you determine if you're a fit with the client's needs, and if they're a fit for your process.) You can use the "First Call Questions" special report to help identify questions to ask. If you're not rejected everyone once in a while (told your prices are "too high"), your prices are too low. NOTE: If you are a Free or Bronze level member of BeAResumeWriter.com, sign in and check out the Free Level Resources page for some additional pricing research and resources! I always love Robin's insight into Applicant Tracking Systems -- even if the information scares me a bit. ATS software is more pervasive than ever, and is probably the number one thing that will impact the resumes we write in the next 1-5 years. Taleo ATS software is being used by 36.4% of companies -- or about 1/3 of jobs that are publicly advertised. How can you tell? The job posting may say "Powered by Taleo" or the URL of the job posting may include Taleo. 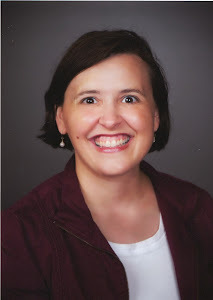 Robin likes to give clients ONE resume (not an ATS friendly one and a non-ATS-friendly one). Font doesn't matter with the ATS. Standard bullets may not be read, but they don't mess up keywords if they're not read correctly, unlike text words. Robin pointed out that accented words will screw up keywords. This also applies to client names with an accent mark -- like José -- as one participant on the Facebook Live broadcast pointed out. Tables, graphics, and columns CAN mess up fiends in the ATS -- "like big-time mess up" -- it can put data in the wrong fields entirely. Robin pointed out, however, that it won't "kick out" the resume -- that's a scam. But you won't know if a particular company's ATS software can overcome the formatting issues. So, better safe than sorry. Do not put titles after the client's name -- i.e., MBA, CPRW, PE. These may cause problems with data field population too. Here was an interesting one I'd never heard before: Did you know that Taleo has a setting that (if enabled), allows the hiring manager to reject all resumes without a physical address on it? So include the address, city, and state. Just in case. Repetition is encouraged in ATS-friendly resumes, even if it duplicates information from work experience to work experience. Duplicate content can strengthen keyword density. 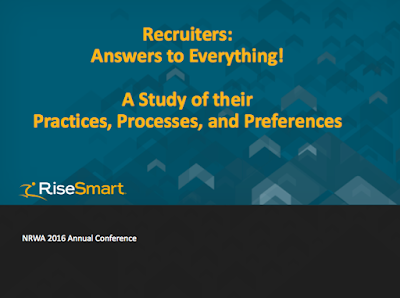 Following immediately after Robin Schlinger's session on ATS resumes, the logical question (one asked by audience member Thomas Powner and deftly answered by Wendy, was: How do these beautiful resumes fit into an ATS-friendly (ugly!) world? Wendy's answer: She would only do these types of resumes (with images, tables, charts, and other graphics) if the client's job search was focused primarily on networking and referrals. If you're not doing an ATS resume, graphics, tables, and images can communicate information effectively and succinctly. One thing that hasn't changed with the "modern" resume format -- the importance of the top third of the first page of the resume. Wendy advocates "Start With the Wow" -- make every word count in this area. Consider including third-party endorsements and testimonials for additional impact. Also, Wendy says to consider fonts and design choices on the modern resume -- they need to correlate with the client's desired industry and their personality. There's no more powerful testimonial for the information that Elaine and Lucie shared than the fact that right before their presentation, Lucie swept the ROAR Awards (Recognizing Outstanding Achievements in Resumes) for Experienced Resume Writers. To me, that really communicated the value of assessments that they use in their branding work. Specifically, they focused on the Reach360, DISC, and StrengthsFinder assessments. Lucie emphasized how having this assessment information helped her overcome writer's block -- the data gives her both concrete information and a point of view for her client, which makes the resume easier to write. Again, this strategy is obviously working for Lucie, as her award-winning resumes demonstrate. Assessments like these are things that more of us resume writers probably need to be using. "Doctor Brandi" was hilarious, and I wish more of the attendees had been able to participate in her presentation. As is usually the case, though, attendees who departed the conference early to make a flight missed this fabulous closing session. Doctor Brandi suggests creating an Ideal Client profile and using that to attract your perfect clients. (I believe strongly in that too!) She also had attendees write down "3 words that describe your brand." This was a fun exercise. Then, she encouraged resume writers to align their ideal client profile and personal brand and articulate it -- and COMMIT to it. She said "you never want to be off brand." There were a LOT more takeaways from the NRWA Conference, and I'll be sharing more of them, so stay tuned! Career Professionals: Are You Making These Mistakes With Your Social Media? On our "Social Media Strategies" call last month, Sean asked me to come up with the "Biggest Mistakes Resume Writers Make On Social Media." Here is an excerpt of four items from that list of mistakes. Sean asked me to handle the part about the biggest mistakes that résumé writers make because, again, this is an area that I have not only a lot of interest in -- but I also analyze a lot of what those of us who are posting on social media have done. Mistake #1: Not Posting EnoughThe first mistake that I have seen is that you’re not posting enough. That’s one of those things that’s a hard thing to handle -- especially when you’re getting started, or you have a small following. You think, “Gosh, is it worth my time and effort to put that content out there, if nobody is reading it?” But the neat thing about social media is it has a huge shelf life. So even things that you have posted months ago or weeks ago you can always resurface that content as your audience continues to grow. Not posting enough is probably the biggest mistake. Aligned with that is not prescheduling content. I talked before we started the call recording, a lot of us obviously wear a lot of hats, and so I know when I get busy with working with my actual one-to-one resume clients, the stuff that suffers the most is my marketing -- my blogging, my social media posting -- so one of the things that you can do is if you’re finding yourself in a slow period, go ahead and preschedule content. I use Hootsuite -- as well as Facebook’s native ability to preschedule posts -- so that I have content that is out there on a more regular basis, otherwise I look up, and suddenly it has been a week and I haven’t put anything out there. Make sure that you are using your time and scheduling the content ahead of time when you’re not as busy, so that it is out there on a consistent basis. Mistake #2: Only Posting on Your Facebook Business PageAnother big mistake that I’ve seen — and I’ve seen it on both sides -- I’ve seen it as a mistake when people don’t do it and I’ve seen it be tremendously effective when people do it -- is when you only post on your (Facebook) business page. If one of your goals is to try and grow your Facebook following, one of the ways to do that is to get people who already know, like, and trust you as a human being, to follow your Facebook Business Page. So, cross posting some of that content — although not at the same time — that is also one of the mistakes — posting the same content, either on multiple pages that you manage or on your personal and business page at the same time, don’t do that. But if you shared a resource over on your Facebook Business Page, then share that on that your personal Facebook page too: “Hey, I just wrote this blog post about the five biggest mistakes people make on their resumes” and put that on your personal profile, because for at least 99 percent of us, we are more likely to have more friends on Facebook than we have followers for our business page. One really effective way that you can grow your audience on your Facebook Business Page is to get some of those friends to follow you. 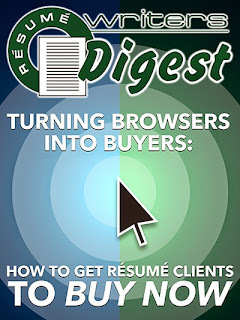 I talked about this on the Get Clients Now program for the last couple years, the sources of new clients for established resume writers a lot of times are referrals, and it’s not just referrals from past clients-- it’s people that we interact with on a daily basis. So, posting content on your Facebook business page and then sharing it on your personal Facebook page, or just sharing information about the work that you’re doing with clients on your personal page. Celebrating and shouting out the work that your clients are getting in terms of results -- but putting that on your personal Facebook page so that folks know that you’re a resume writer. There are career industry colleagues that you would never know what they do for a living if you just looked at their personal page-- and maybe they are doing that intentionally -- but if it’s your goal to get more fans and followers and engagement and clients and all of those things, that’s a simple way that you can help increase your ability to get your message out. All of those engagement strategies are going to help your content get organically boosted in people’s Facebook feeds going forward. Don’t look at it as just a one-way conversation; look at how you can encourage engagement. And, like Sean was talking about, with Facebook Live, we talked about having people submit questions. You can do that on your own Facebook page too. “Hey, I am working on a new resource on job interviews. 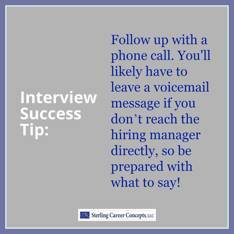 What questions do you have about the job interview?” and then let people submit questions onto that post. It not only gives you better insight into what challenges and struggles people are having, but it also helps you identify particular clients that you might be in the position to help. The other thing is to mix up your content. Another mistake that people make -- and particularly when you’re talking about pre-scheduled content -- is that they focus primarily on text-based posts, because obviously those are the easiest, in terms of creating the content. But you really want to have a mix of text posts, videos, and picture posts. I know a lot of you guys use the BeAResumeWriter.com Pass-Along Materials and quote those directly. I just saw a perfect example today Sterling Career Concepts took one of the excerpts from a Pass-Along Materials content and made it into a picture post. So she took the text and just put it over a background and shared that content. Look at different ways that you can share the information in terms of not just doing static posts. These are just FOUR of the mistakes I outlined for career services professionals. If you're interested in learning what the OTHER mistakes are -- and the other information Sean and I shared in the training about growing your fans and followers, using analytics to get better engagement, and more, check out this special offer! Get access to the Social Media Strategies training. Choosing to be your own boss can be amazing. But if you're currently working a "regular job" -- and have never been self-employed before, I suggest you consider starting your own business ONLY if you know the pitfalls, and what to expect and how to deal with it. You Must Be Self-Motivated. You need to be the type of person who can get work done when it needs to be done without anyone telling you to do it, including wearing the many "hats" of a sole proprietor, such as bookkeeper, paperwork coordinator, and marketer. You Must Have Good Time Management Skills. No one is going to tell you when to work; you will be in charge of that. You will need to be able to estimate accurately how long any one job will take you, when you're going to do it -- and you must be able to do this with multiple clients simultaneously. You Must Be Able to Work with Many Personalities. When you are self-employed, you don't work with just one client at a time. You typically will be working for several at once, all with different personalities. If youíre good with people and are able to take criticism, you will do great as a self-employed resume writer. Also: TRUST YOUR GUT when taking on new clients. Don't be desperate -- if you don't get a good feeling when you talk to someone initially, do NOT take them on as a client. You will end up regretting it. You Need Your Own Equipment. When you're self-employed, you must supply your own tools such as computers, Internet connections, software, and so forth. As the business owner, you're responsible for all your own stuff. You Must Pay Your Own Benefits. If you currently have health insurance in your job, you need to know that as a self-employed person, you pay for your own benefits -- including self-employment taxes, insurance, and more. Health insurance can be VERY expensive, so you need to know what this will cost you before you leave a job with insurance. You Must Be Able to Ride the Wave. Payments don't always come on time like with a job. (This is the thing my Mom had the hardest time with understanding. She keeps trying to get my self-employed brother to get a job so he has a "steady paycheck.") The reality: You won't get a paycheck every two weeks, so it will make it harder to budget your money. You will likely have times of feast and famine. If you can budget through the hard times and ride the wave, you'll make it as a business owner. You Must Be Good with Money If you're not good at budgeting, being self-employed might be difficult for you. For example, you should set aside 15-25% of all revenue you receive for taxes, savings, and for the slower months. Hopefully, this didn't discourage you. You have to remember that some of the security you think you have in a regular job is just an illusion. Getting paid every two weeks isn't as important as making enough money on a regular basis to pay your bills and save for your future. 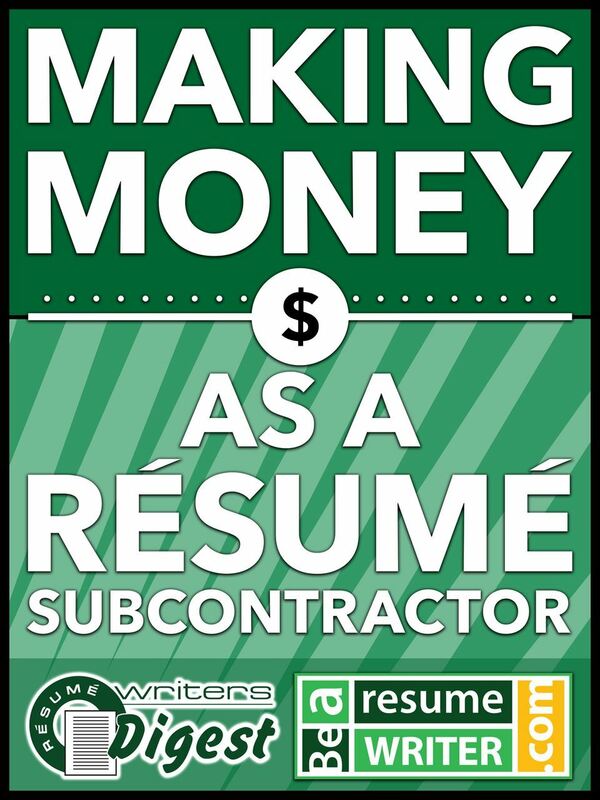 All you have to do is train yourself to mind your money and build your business without anyone telling you what to do and you'll be successful as a self-employed resume writer.